M. Night Shyamalan's compelling, confounding, and idiosyncratic Glass is like looking at an elegant chandelier. We marvel at its construction, the way it captures light and color, the reflection of ourselves we see in its crystal, the audacity of its design, and then the chandelier falls on top of our heads. Elegant. 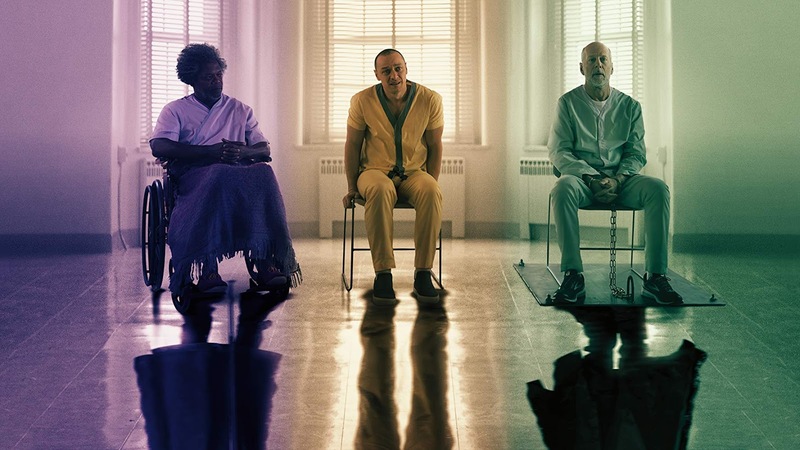 Glass is, of course, the sequel to Unbreakable and Split 19 years in the making. A lot has changed since Night, then a wunderkind at the peak of his powers, dazzled us with his comic book-inspired origin story of David Dunn (Bruce Willis), an ordinary man who discovers he's superhuman. Unbreakable was released in 2000, at a time when superhero movies had just experienced the start of an unprecedented boom that began with Bryan Singer's X-Men, which had arrived just months before. Two decades later, in an age where there have been dozens of superhero movies that cost hundreds of millions and have grossed billions of dollars, Night returns to the genre with Glass, a superhero movie that has no budget to be a superhero movie but goes for it anyway. One of Night's most obvious tricks is the way he repeatedly telegraphs a climactic showdown at Osaka Tower, the newly-built tallest building in Philadelphia, but the hero and villains never make it there - it's not in the budget! In Glass, the older and greyer David Dunn has become a local legend, a superhero vigilante called the Overseer (also called the Tip-Toe Man and the Green Guard). David is on the hunt for Kevin Wendell Crumb (James McAvoy), also known as the Horde, who suffers from Dissociative Identity Disorder and manifested 23 distinct personalities that serve the 24th, the superhuman, animalistic Beast. Now a widower after his wife Audrey (Robin Wright) died of leukemia five years prior, David runs a home security firm with his son Joseph (Spencer Treat Clark) but he has no clients, which conveniently lets him walk the streets of Philadelphia looking for the Horde. Joseph is David's Man in the Chair and he still adoringly worships his super dad. Meanwhile, the Horde is up to his old tricks, kidnapping teenage girls to feed to the Beast. David and Joseph's strategy is to walk around Philadelphia hoping David runs into the Horde and sure enough, he does! That was easy! After a super-tussle filmed with a bizarre crosscutting of first-person POV and wide angle shots of two men shoving each other into walls and through a window, David and the Horde are captured by the police and remanded to the care of psychiatrist Dr. Ellie Staple (Sarah Paulson). The rest of Glass takes place almost entirely in the gloomy, foreboding Raven Hill Memorial Hospital (is Hannibal Lecter in the basement? ), which is now outfitted with multiple cameras and elaborate traps to hold three captives who, according to Dr. Staple, suffer from the delusion of grandeur that they are superheroes. Staple (that is to say Night) telegraphs a climactic twist when she says "they" gave her three days to convince David, Kevin, and the third inmate, Elijah Price (Samuel L. Jackson), the mastermind who helped create David and has been imprisoned ever since, that it's all in their heads. David's cell is built to spray him with gallons of water if he gets out of line; water is his weakness, but whereas before in Unbreakable, it was inferred that David was susceptible to drowning because of the density of his unbreakable bones and skin, now, apparently even a cold shower renders David powerless. Meanwhile, Kevin's cell is built with strobe lights that force him to instantly switch among his 24 personalities. Each time Kevin goes for the door, the lights force him back, and none of his 24 personalities ever think to just close his eyes. Meanwhile, Elijah keeps appearing out of his cell despite the hospital keeping him heavily sedated. The kindly but mysterious Dr. Staple tries to convince David, Elijah, and Kevin that the only thing special about them is how crazy they are and she starts to get through to the Overseer and the Horde. As they begin to doubt themselves, each inmate has their particular True Believer visit them at the hospital: David has Joseph, Elijah has his mother Mrs. Price (Charlayne Woodard), and Kevin has Casey Cooke (Anya Taylor-Joy), the girl he abducted in Split but the Beast let go because, as children who suffered abuse at the hands of a parent, they are kindred spirits. To better understand Kevin, Casey gives herself a comic book 101 crash course while Dr. Staple rails against comic books and the fanboys at Comic-Con in a bizarre rant that comes out of left field, but it sets up an overall statement about the genre that Night seems to be building to. Eventually, Elijah plays his hand: he wants the bad guys, Mr. Glass and the Beast, to team up and blow up Osaka Tower. Naturally, David has to free himself and stop them and it culminates with an epic super brawl at Osaka Tower a weirdly staged super tussle in the hospital parking lot. David fights the Beast but there's plenty of time for asides with all of the major players as the Big Reveal is dropped, which is shocking to anyone who didn't figure it out already: Kevin's dad was in the same train crash that David was in back in 2000, ergo Mr. Glass created Kevin Crumb's super-villain at the same time he created David Dunn the superhero. And then, just as that sinks in, all three super people are dead in horrible fashion! A SWAT Team drowns David in a puddle, shoot Kevin in the stomach, and Mr. Glass dies from his wounds when the Beast mauls him. As all three die in the arms of their True Believers, Night drops his Real Trademark Climactic Twist: the "they" Dr. Staple referred to earlier is a secret society that has existed for 10,000 years who have suppressed and eliminated superhumans as they've emerged into the world. This unnamed cabal has black cloverleaf tattoos on their wrists and likes to dine at a particularly fancy restaurant. Then, Dr. Staple learns Elijah's Twist: he was never planning on blowing up Osaka Tower (it's just not in the budget); the Mastermind wanted Ravin Hill's hundreds of cameras to record the fight between David and the Beast so the True Believers could remotely upload the footage to everyone's TV and phones. The point was for people to see for themselves that superhuman people exist. So, Glass is weird, and awkward, and frustrating, but also compelling, brave, and fascinating. McAvoy goes for broke, jumping back and forth between a couple of dozen personalities at the drop of a hat while still making each one feel distinct. Once he's allowed to stop Faking It Buster Bluth-style and lets loose, Jackson relishes playing Mr. Glass again. The odd one out is poor Bruce Willis, who has little to do except wait around to fight and die, in that order. David just fades into the background and has the thankless job of being the stoic good guy. Compared to his flashy villains, Night was interested in David Dunn the least and ultimately, Glass is an ignoble ending for our Unbreakable superhero. Paulson is terrific as Staple, keeping her cards close to the vest the whole film, and there isn't nearly enough of the magnetic Taylor-Joy, who steals every scene she's in, especially with McAvoy. A film whose plot points are fueled by coincidence and contrivance, Glass is very much like the heretofore mentioned chandelier that eventually falls on your head, but what a way to go. Elements of his work may look worthy of a gallery space, but Merry feels otherwise. 'Pieces of embroidery don't need to be stuck in a picture frame on a wall. You can wear them and bend them and put them in gilmore girls shirts the washing machine when they get dirty. In the five years before the recession hit, breakfast pizza shirt sales jumped 64 percent, according to NPD Group, a consumer behavior research firm, making it one of the fastest growing sectors in the industry. But traffic boyfriend and girlfriend shirts slowed as the economy tanked and the ranks of the jobless soared. By the time unemployment hit 10 percent in the fall, breakfast traffic was down 4 percent.